Crocodiles and all that stuff? Love it! I’m just on the border of Namibia and Botswana and in a few days time I’ll arrive with a big group of riders, into Zambia – the classic Victoria Falls. We’ve had a great adventure ride from Cape Town, north and look forward to spectacular finish at the falls. 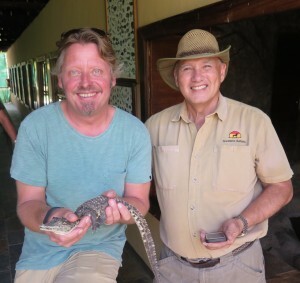 The first thing we do when we get there is to visit old Joe McGregor Brooks, the true African Crocodile Dundee, in Livingstone – just a bridge away from the falls in Zimbabwe. Joe, starred in our Long Way Down series and has been a major focus for our annual adventures tours in Africa. Joe, who’s now 87 years old, takes us and our group around his collection of killer crocs, crocs that have been captured due to their ‘bad behaviour’. What’s Joe’s secret to his long and eventful life? Croc fat! He takes a spoonful of croc oil every day. “When a croc looses a leg, it heals up in days – so what’s good for a croc is good for me.” So Joe claims. Well fair game – I’m ordering mine today! If you want to have a real African experience you wouldn’t do better than to visit Joe’s place. Mention my name, book yourself into one of his incredible castle apartment and enjoy a game drive with him – who knows, you may get a discount if you say “Charley sent me!“. For more info about Joe’s place – known locally as Gwembe Safaris… check out all the details here on their website www.gwembesafaris.com or email Ian, his son for more info at gwemsaf@iconnect.zm. Joe also has his autobiography on sale – which is truly an amazing historic look at how life was back in the day as a young scot arriving in Africa, and living the life of a hunter – now turned conservationist.